Modern and ancient coral reefs and shallow water carbonate systems can provide excellent insights into the workings of the Earth’s climate system. In part, this is because the long-term survival of such systems is highly dependent on climatically sensitive parameters like seawater salinity, acidity, nutrient availability and temperature. Moreover, the dependence of shallow water systems on photosynthesis means that they grow most efficiently close to the sea surface, and typically are able to keep pace with changes in sea-level. This ability means that tracking changes in the growth rates of coral reefs and shallow water carbonate systems through time ostensibly allows key insights to be made into the rates and magnitude of past sea-level change. Nevertheless, coral reefs and shallow water carbonate environments in general are highly complex ecosystems controlled by a multitude of physical, chemical and biological processes. This complexity means that extracting meaningful information on past sea level or climate from any one record of coral reef growth through time is potentially difficult. One way around this issue identified by palaeoenvironmental change team member David Kemp and Peter Sadler of The University of California (Riverside) is to look at many thousands of growth rates from many hundreds of globally distributed coral reef systems. By taking this ‘big data’ style approach, they were able to build a globally representative, holistic picture of coral reef growth through the last 25,000 years, an interval that encompasses a major (~120 metre) sea level rise caused by the deglaciation that followed the last glacial maximum (see figure below). Emerging from the ‘noise’ of this very large dataset are clear trends in coral reef growth rates that closely track changes in sea level. 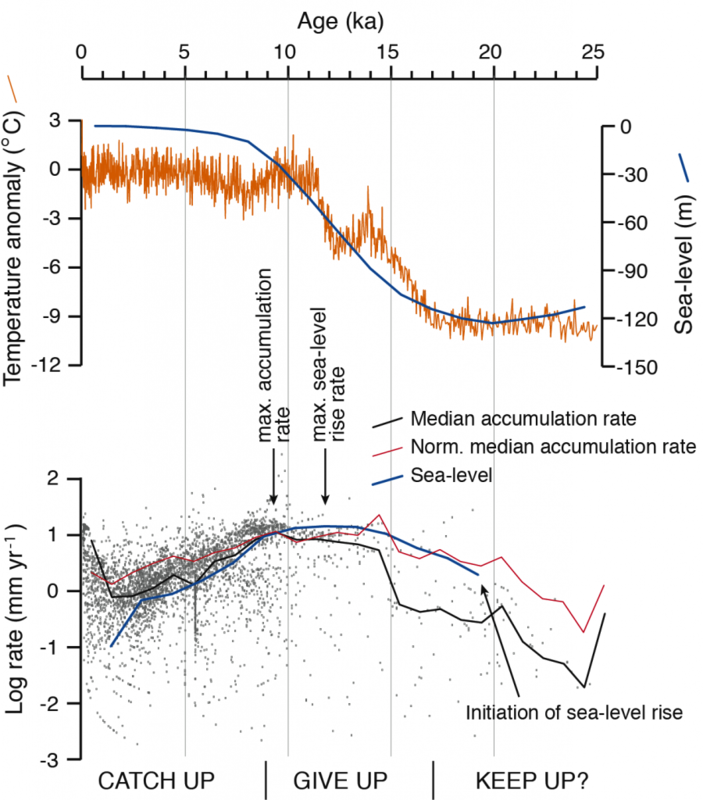 In fact, the dataset is sufficiently detailed to recognise that the response of coral reefs to changes in sea level is typically lagged, with a delay of ~3000 years. The globally distributed nature of the data used in the study also allows quantitative insights to be made into the influence of latitude on carbonate growth rates, an effect primarily linked to seawater temperature and annual light availability for photosynthesis. The study highlights the potential for using very large datasets of pertinent geologic data to gain fundamental, holistic insights in to the response of sedimentary systems to global palaeoenvironmental change. How much carbon dioxide is absorbed by the world’s forests?